I used my first free credit at audible.com to download the audiobook of The Lady of the Rivers. I absolutely love the myths of the French royal families who descended from merpeople and the story of Melusina is evident throughout this book. The audiobook was well-performed and I really enjoyed this book overall. It’s a different feel from The Tudor series, but once again, Philippa Gregory doesn’t disappoint. One of the strangest side effects of reading this book, is that it affected my gardening….the main character, Jacquetta, gardens according to astronomy….then later this year I found out about biodynamic agriculture…suddenly I’m much more concerned what phase the moon is when I’m planting. Bibliographic entry Gruber, M., & O’Hare, D. P. (2005). The witch’s boy. New York: Harper Children’s Audio. Description Long long ago a boy named Lump is born to a witch. The prejudice he experiences his whole life, because of his facial deformity and strange behaviour, turn him into an angry young man. His envy drives him to violence and he loses what he loves most. Reaction A fantastic tale that weaves pieces of well-known fairytales together while following the journey of the unknown character, Lump. The themes and topics are universally human and this book would appeal to any fantasy lover. 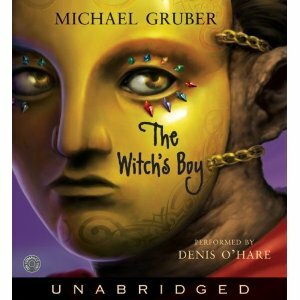 Denis O’Hare, the performer on the audiobook, is a wizard as he vocally masters dozens of identities in the book.